At Ardenwoods, you’ll be treated every day to a diverse menu that’s as healthy as it is delicious. Created by our Executive Chef and his talented culinary team using fresh produce from local farmers, our “from scratch” dining options are sure to please. 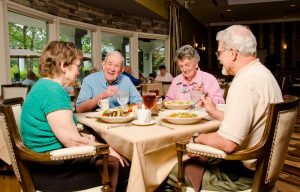 Ardenwoods’ innovative dining program provides flexible dining times and menu selections and allows you to choose from a variety of dining options—the Mountain View Dining Room, Mountain Laurel Grille, or our outdoor terrace with a sweeping view of the Blue Ridge Mountains. You even have the option of ordering your meal for take out. Your monthly dining allocation can be spent any way you please. Want to have your family or friends over for dinner? It’s covered. Had a late lunch and just want a cup of soup and a glass of wine for supper? The choices are all yours. Take a look at a sample of our healthy and delicious, chef-prepared menu selections.